Volume 1 | Issue 1 | Apr – June 2016 | Page 40-42|Shailesh Hadgaonkar, Ketan Khurjekar, Kunal Shah, Ajay Kothari, Ashok Shyam, Parag Sancheti. Authors :Shailesh Hadgaonkar, Ketan Khurjekar, Kunal Shah, Ajay Kothari, Ashok Shyam, Parag Sancheti. Wockhardt Hospital and Medical Research Centre Agripada, Dr Anand Rao Nair Road, Mumbai Central, Mumbai India. Thoracolumbar fracture dislocations are devastating injuries caused by high velocity trauma. Reduction of such highly unstable situations poses great surgical challenge to treating surgeon. Various reduction maneuvers are described diversely in literature. We describe a simple and easily reproducible vice grip-parallel rod technique which provides excellent reduction and maintains sagittal alignment. It is safe and minimizes additional neural injury. These surgeries aim at early and better mobilization with and without wheelchair of the patient and understanding the chances of neurological recovery are extremely low. Key Words: Throcaolumbar fracture, dislocation, reduction, technique. Fracture dislocations of thoracic and lumbar vertebrae are commonly encountered and are a result of high velocity trauma (Fig 1)  . Surgical treatment poses challenge in terms of safe and effective reduction maneuvers. Various techniques have been diversely described in literature for reducing highly unstable thoracolumbar fractures. We describe a novel reduction maneuver which is slow, steady and graded technique using four parallel rods and vice grips. We believe that this technique is easy to perform and reproducible, tailor made and maintains good sagittal and coronal balance of spine in such unstable situations. These surgeries are done for mainly early mobilization with a stable spine understanding that the neurology will rarely improve. 1) The patient is positioned prone very carefully taking care to prevent further neurological insult. Maintaining the lumbar lordosis can help in partial vertebral reduction. 2) Standard Posterior midline approach taken and exposure done. Utmost care taken at fractured vertebrae level to prevent neural injury. 3) Pedicles identified and screws are inserted at two levels above and below the level of dislocation bilaterally (Fig 2a). Role of assistant surgeon is very important in view of giving the counter traction and support the completely shattered spine while inserting pedicle screws. We have seen the shortening of the column because of overlapping of two diseased ends. 4) Two small rods are applied: one below the level of injury and other above (Fig 2b). Once the rods are secured, a three step maneuver is performed. Two rods are held securely by two vice grips and gentle, slow and sustained distraction applied across the vertebrae (Fig 2c). With distraction maintained the surgeon gently pushes the anteriorly displaced proximal column and pulls the distal column (commonly encountered situation where proximal column is anteriorly displaced with respect to distal one) leading to unlocking and disimpaction of dislocated vertebrae. Now opposite forces are applied pulling the proximal column and pushing the distal column to achieve reduction of facet joints bilaterally (Fig 2d). The reduction is checked under fluoroscopy. Sham rod is immediately fixed before the check image. 5) Care should be taken to avoid unnecessary jerky and violent movements. Any bony or soft tissue structures obstructing the reduction should be cleared before attempting reduction. 6) The operating surgeon maintains the reduction and the assistant applies rod on the opposite side and temporarily fixes the vertebral column in this position. Now the temporary rods are removed and another long rod is applied on other side too (Fig 2e). 7) Complete decompression is performed at injured level and neural elements checked for any breach and repaired .Cross links applied. 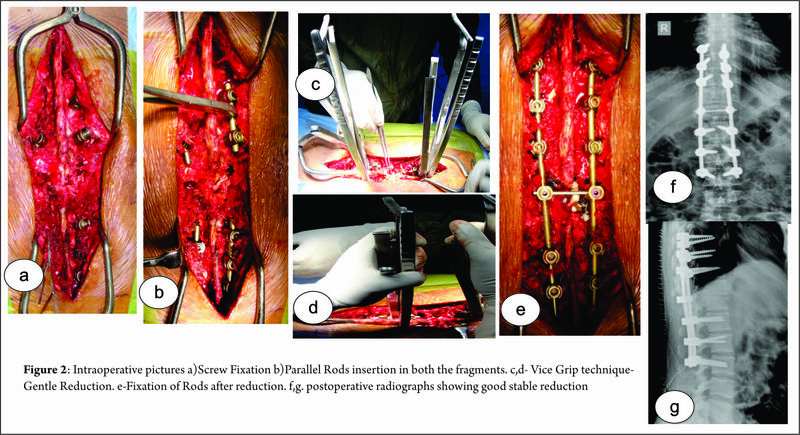 8) Autografts from laminae and spinous process along with iliac crest bone graft used to enhance fusion. The patient is mobilized as per tolerance with help of brace from second postoperative day in most of the cases. Fracture dislocations of vertebral column are highly devastating injuries and are caused as a result of high velocity trauma. These are commonly seen due to road traffic accidents, fall from height and are often facilitated by risk factors like rheumatoid arthritis etc [1,2]. The mechanism of such injuries varies and is usually a combination of flexion-distraction, translation-shearing or hyperextension injuries [1,3]. Reduction of thoraco-lumbar vertebral fracture dislocations are diversely described in literature. Closed reduction technique using cotrel frame was described initially  . However recent trend is shifted towards open reduction which enables us to see neural elements directly and allows adequate decompression. Open reduction techniques described involved direct manual reduction, interspinous lamina spreaders etc [5,6,7]. However they are associated with high failure rates, therefore more aggressive techniques including facetectomies, laminectomies etc are now employed. Our technique described, provides excellent means of reducing highly unstable vertebral dislocations with minimal risk of neural injury. It provides graded, sequential reduction after securing proximal and distal anchorage points (small rods).Although this technique significantly aids in reduction, it should be remembered that it can be difficult at times to replace temporary rods with longer rods.as t is one under vision, it’s easy to be safe while doing this manoevour. We keep a detailed neurological chart and ASIA impairment scale. We believe that this technique provides safe and easy way to achieve reduction and maintain sagittal alignment. It is easily reproducible, but we would like to emphasize the importance of a experienced surgeon to prevent additional neural injury while manipulation. Also we would like to mention that this technique is aimed at stabilization for wheelchair mobilization and understanding neurological damage and recovery.This technique helps in avoiding the unnecessary bone cutting/osteotomies as well as shortening procedures and reduces morbidity as it reduces significant time also in difficult reductions. 1. Vialle R, Charosky S, Rillardon L, Levassor N, Court C(2007). Traumatic dislocation of the lumbosacral junction diagnosis, anatomical classification and surgical strategy. Injury 38:169-81. 2. Hauge T, Magnaes B, SkullerudK(1980). Rheumatoid arthritis of the lumbar spine leading to anterior vertebral subluxation and compression of the caudaequina.Scand J Rheumatol 9(4):241-4. 3. Cho Sk, Lenke LG, Hanson D(2006). Traumatic noncontiguousdouble fracture-dislocation of the lumbosacral spine. Spine J 6(5):534-8. 4. Kerboul B, Lefevre C, Le Saout J, Mener G, Miroux D, Roblin L, Courtois B(1986). [Stabilization of thoraco-lumbar spinal fractures using Harrington’s equipment.Study of the evolution of spinal curvatures]. Neurochirurgie 32(5):391-7. 5. Ovejero AMH, Mata SG, Lecea FJM, Zubiri IG, Zubiri LA(2010).L3-L4 Dislocation without Neurological Lesions. Bulletin of the NYU Hospital for Joint Diseases 68(1):60-4. 6. Fazl M, PirouzmandF(2001). Intraoperative reduction of locked facets in the cervical spine by use of a modified interlaminar spreader: technical note. Neurosurgery48:444-5. 7. Lim MR, Mathur S, Vaccaro AR(2009). Open reduction of unilateral and bilateral facet dislocations. In: Vaccaro AR, AlbertTJ (ed). Spine surgery: tricks of the trade. 2nd ed. Thieme,new york;p18-20. 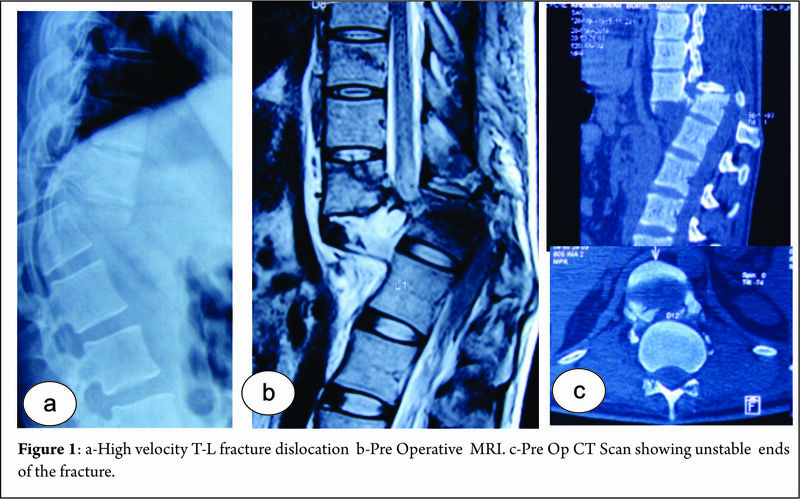 How to Cite this Article: Hadgaonkar S, Khurjekar K, Shah K, Kothari A, Shyam A, Sancheti PA Novel Reduction Manoeuver for Highly Unstable Thoraco-Lumbar Fracture Dislocation: Technical Note. 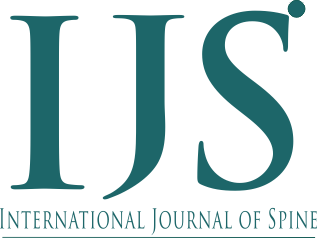 International Journal of Spine Apr – June 2016;1(1):40-42 .